After meeting privately with its attorney for about an hour, the Southern Shores Town Council decided Tuesday night to look at possible changes to its zoning ordinance to limit the size of new houses. A new state law prohibits the town from continuing to enforce its current limit of seven bedrooms. The issue took on more urgency as word got out of a planned 16-bedroom “event” house on the oceanfront. Saga Construction has applied for a Coastal Area Management Act permit, and according to Town Manager Peter Rascoe, the house would appear to meet most if not all of Southern Shores’ ordinances with the exception of the now-defunct seven-bedroom maximimum. One limiting factor, however, may be the town’s occupancy limit of 14 people or septic capacity for the same number. It’s also possible that covenants under the Southern Shores Civic Association could address the issue. Town Attorney Ben Gallop said the new state law restricting municipal control over the look and size of houses specifically excludes homeowners associations and civic associations. 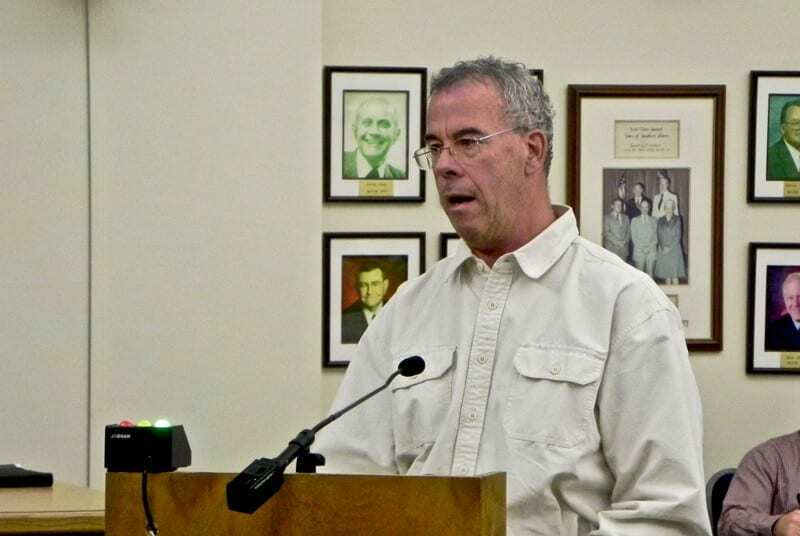 After the closed session, Gallop said that if the Saga project is submitted for a building permit, the town’s ordinances would be applied the same as they would for any other plans. Meanwhile, the council voted to direct Gallop, Rascoe and Town Planner Wes Haskett to develop possible amendments to address large houses. Earlier, council members urged citizens to contact legislators to reconsider the legislation. The swearing in of three new council members and the construction issue drew a full house for the Tuesday night meeting. But only four people spoke specifically about the disputed project during public comments. Ike Sherlock, whose home is at 66 Ocean Blvd. next door, said that the planned house would not live up to the town’s land-use plan, which specifies a low-density, family-oriented residential community. “It is an event venue, a mini-hotel and a commercial venture,” he said. In an e-mail to town officials, his wife, Paula Sherlock, said the plans call for a ballroom and a large party deck. Nags Head and Kill Devil Hills have both looked at the issue. Nags Head plans to limit square footage, which would limit the number of bedrooms. Kill Devil Hills has taken no action. Recent construction has trended toward large “celebration” houses aimed at the growing market for weddings on the Outer Banks. Besides size, safety has become a concern because the houses are considered single-family residential construction, not commercial property, and do not need sprinkler systems.